Six months before Guardians of the Galaxy opened: "Nobody cares about GotG! This is going to be Marvel's first failure." Six months before Ant-Man opened: "Nobody cares about Ant-Man! This is going to be Marvel's first failure." Using Hank Pym's proprietary technology, Scott Lang shrinks to become the half-inch superhero Ant-Man! So Ant-Man opened this past weekend, and surprising absolutely no one, it was not a failure. It was fun, adventurous, it did its part to continue building the MCU... and it proved that nobody cares one little bit who directs these movies. Edgar Wright had famously been working on an Ant-Man script since before Iron Man, but had "creative differences" with Marvel just before shooting was due to start, so now the movie is directed by someone you've never heard of. And this isn't even the first time it's happened - Thor 2 lost both Kenneth Branagh and Patty Jenkins before it found its nobody, but that didn't stop anyone from seeing it. We want the characters, not the real humans. Wright still gets a writing credit on the movie, though, so clearly a lot of his work is still in there. And the Ant-Man design is fundamentally unchanged from the first test-footage that leaked in 2012. 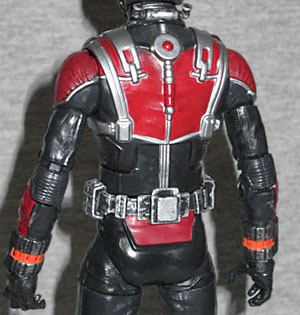 The suit is red and black - the traditional Ant-Man colors - and the shape of the panel on his chest is similar to the symbol on the comicbook costume. 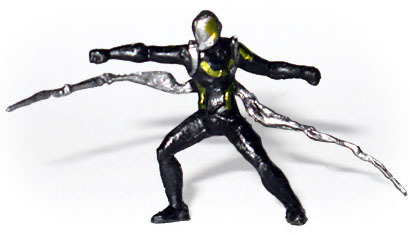 He wears a silver harness and has tubing running all over his torso - presumably a Pym Particle delivery system. He has fancy tech on his belt and wrists, but the rest of the outfit appears to be leather or something. The movie shows Scott with loose tubes running up into his helmet, a massive weak spot; the toy just has the nozzles sticking up on the back of his neck, without the hoses. Actually, speaking of the helmet, it's different on the toy than it is in the film. Since, when you shrink, oxygen molecules would be too large for your lungs to process, the Ant-Man suit is entirely self-contained, covering the wearer's face. The toy leaves the mouth exposed, which looks more like the comics, but isn't exactly screen-accurate. And is especially weird since, like we said before, the suit design has been pretty much locked down for years now. There are two Ant-Men in each case of figures, so you'll probably be able to compare paint before you buy. Area of particular interest include the silver tubing on his chest, and the orange on his belt and wrists. 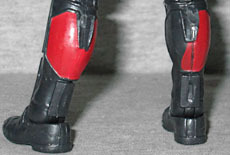 My figure has a paint error on the back of the right leg, where a section of red was not fully painted. That's not really something you can see through the front of the packaging, though, but it's also not a majorly distracting flaw. This is an entirely new sculpt without a lot of re-use potential, but Hasbro did not skimp on the articulation. Ant-Man has swivel/hinge joints in the ankles, hips, wrists, and shoulders; double-hinged knees and elbows; single-hinged torso and neck; swivel thighs, waist, and biceps; and a balljointed head. The knees are a little rubbery, but not so much that he won't stand. His hands are molded in "gripping" poses, but he doesn't have any accessories to hold. Which isn't to say that he doesn't have any pack-ins. He's a shrinking hero, so naturally he comes with a smaller version of himself! The figure is only ¾" tall, but would be bigger if he was standing up straight. As it is, he's in a seated/squatting pose. And why is he in such a pose? Because he comes with an ant to ride! It's 2¾" long and has a 3⅜" wingspan. There is no articulation, but the tiny little Ant-Man figure can sit on its neck perfectly. 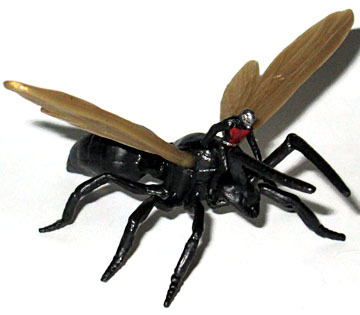 And just in case that wasn't enough, we also get a small, unarticulated figure of the film's villain, Yellowjacket! He's in a dynamic fighting pose, and his plasma cannon arms spread out behind him. He's slightly taller than the mini Ant-Man figure, and the metal arms spread out 1⅜" wide. Amazingly, the figure can stand securely on its own - even a minor molding error would have condemned Yellowjacket to a lifetime of laying on his back or leaning against other characters. And naturally, he comes with a piece of the series' Build-A-Figure, Ultron. 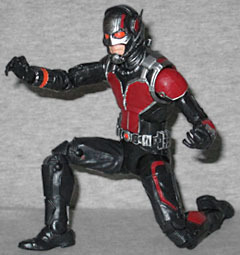 Why does an Avengers BAF come in an Ant-Man series? Who knows. Scott comes with the head, which is a pretty important bit to have: you could skip an arm or a leg and pretend Ultron is just battle-damaged, but you've got to have the head. A lot of people collect the movie figures, even if they're not interested in the comic ones. Lucky for them (and for those of us who get everything), Ant-Man is really pretty good - and the inclusion of tiny forms of him and his enemy makes this set even better!